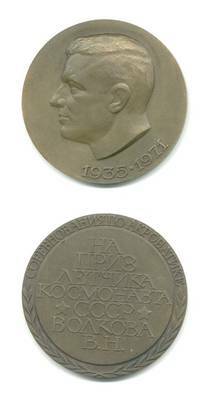 See scan - perfect condition for this nice Soviet Russian USSR table medal / plaque. This is a really great bronze and minted medal of the Russian aviation pilot astronaut / cosmonaut V. Volkov issued in order to commemorate his flight in 1971 and presented to participants at the acrobatics chamionship. Scarce and nice space / cosmos collectibles and collector item. One of the nice space medals I've seen.